Neath’s ageing council offices, which have stood in the town centre for more than 40 years begin to disappear. 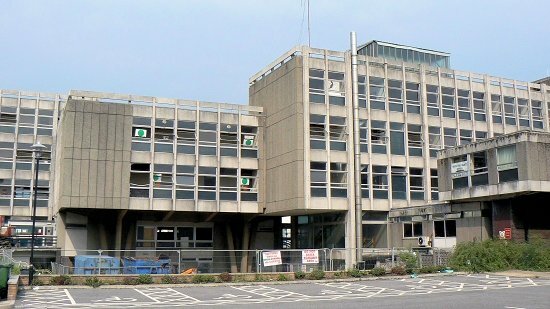 Built in the mid-sixties to house both the Neath Urban and Rural Councils, the building occupied the old fair field in Neath. Officially opened in 1964 the foundation stone was laid by Sir David Evans Bevan who also provided the oak from Margam Park which was used for the Mayor's Parlour and the members room. The old building had been in decline for several years and is now replaced by a new centre built on land alongside. And when a second new office was built at Briton Ferry, the building was emptied ready for demolition.. The removal of the old offices is a catalyst for the development of Neath Town Centre and an important step forward in the £80 million project which will rejuvenate a large part of the town centre. The site is used as a temporary car park until work starts on a new state-of-the-art multi storey car park which will be at the heart of the new developments. The temporary car park will provide an added bonus for traders particularly during the September Fairs and Christmas shopping. We look forward to the future of Neath’s re- generation.